Damn coming back home after a lovely weekend away. I could happily have hung out in Martinborough for a couple of weeks, no problems. The little cottage we stayed in was great (apart from the neighbours having a shindig till 4am - grrr). Anyway, the rest of the time was perfect - lots of wine, nice food (Saturday night at the French Bistro) and lots of reading. There was a big old clawfoot bath there that was wonderful to lay around in and a fireplace along with a huge stash of firewood right outside the back door. Brilliant! I did a little bit of drawing too. 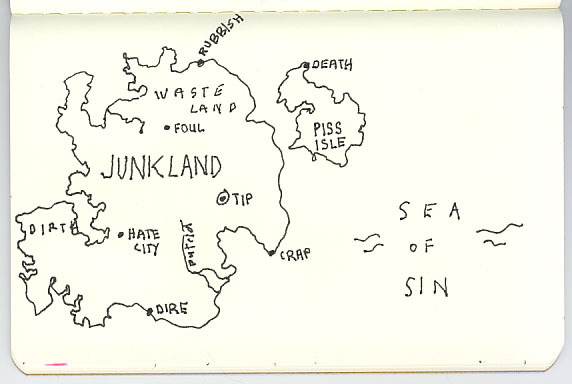 Here's my map of a dismal country. What do you call it SOD? Pychogeography. Or something. There was another drawing I did that I like better but I think it's a bit pornographic for this blog. Oh dear. You weren't staying at Brackenridge, were you? I have no idea what you mean Stephen. You'll have to elaborate. Oh I see :-( I'm going to miss having you around on a more regular basis, Rose. Will things get back to 'normal' -- i.e., is this just a phase? Is it because of your work? My dear Lilly, of course you are not your usual self. Yes, work is the culprit. I will be trying hard to add small entries now and then, but they will be very very boring because there will be so little happening in my life. I spend two months a year working at the office of the Film Festival and end up doing crazy hours, so there is little time for anything other than eating, sleeping and working with a bit of attention paid to my children in between times. But it is kind of fun too since I get to work in an office with other people - nice after being at home on my own the rest of the year. I will keep in touch though, don't you worry! 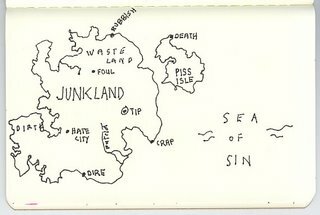 Kind of psychogeography - though that usually refers to the psychological effects of an actual landscape. My psychogeographic map of Wellington - the sites of attraction that make up my mental map - would have some elements the same as yours (art galleries, pubs, etc) but not others. The idea's that a city contains as many cities as there are inhabitants of that city.